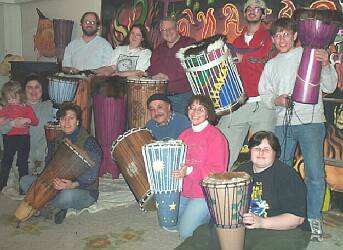 On March 3rd and 4th of 2001, I took a drum building workshop with Stan Secrest of Build-a-Drum Workshops. Several members of my drumming circle had taken Stan's workshop a year earlier and they all came away feeling good about having built some great drums. "A new drum??" I thought to myself, "One never has enough drums!" Here are about half of the participants with their almost-finished drums. It was amazing to see the wide range of designs that came out of the workshop. It felt great being around so much creativity. Some people suspended stones from wires hidden inside their drum...some wrote messages that would only be seen when the drum got reheaded. People put lots of thought and caring into their drums. Oh! In order to see the workshop pictures you must click on the links at the TOP of this page. Start the tour by clicking on "Photopage 1". Links to the workshop photos are at the top of this page.